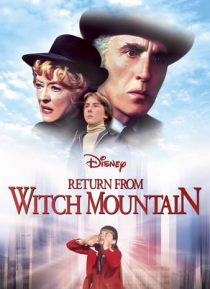 In this thrilling sequel to Disney's ESCAPE FROM WITCH MOUNTAIN, automobiles mysteriously fly and humans float in thin air as sinister masterminds Christopher Lee and Bette Davis unleash a diabolical plan. The entire city of Los Angeles teeters on the brink of nuclear disaster when the greedy criminals manipulate a young boy's supernatural powers for their own devious gain. But the youth's sister … and a streetwise band of truants join forces in a desperate attempt to save the city from destruction.